What are Versions? How do they differ from one another? Are they important? a total of 483 versions (of which 20 versions were not mentioned in Collector). Detailed information about different versions of a set can be hard to find and this isn’t helped by the fact that many were released before 1990, so they are now old and hard to come by. In a small number of cases in Collector, the difference between two versions is explained (eg. 4622, 3186, 3199), but in the majority of cases the difference between versions is more obscure. These ‘branding’ differences may be of significance to some collectors of course, which is why Hennel included them in his catalogue. 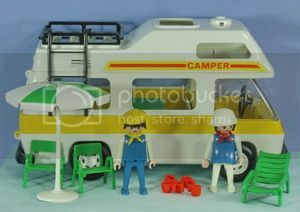 The pictures generally show the differences in content of versions compared side-by side, not the full contents of each version (as in the photos of the two versions of the 3258 camper vans above). I was short of twelve parts so I used Photoshop to change the colours of parts I did have. I also borrowed a few pictures from websites. The data on which the pdf and charts is based is also available in this spreadsheet: here. 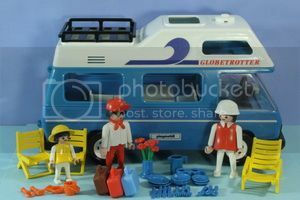 At least some of the 97 version-pairs illustrated would be worth considering for inclusion in Playmobil Collections or Catalogues, if they are not already there! I struggled with many sets because I could not find good enough pictures of contents or set boxes, nor lists of set contents. Of particular value was the topic Datenbank Setinhalt at www.klickywelt.de where set contents of two consecutive versions were both shown for 46 sets. There are some sets where building instructions exist for each version but these are not always available online (I do have the plans for V1, 3 and 4 of 3456, which was very helpful). What I really need is for collectors of MISB sets to open them up and confirm the contents of each version! I am well aware that I have made quite a few assumptions in putting this together, especially my heavy reliance on box pictures. I am sure there are errors (I found quite a few I had made as I checked through!). If you can throw any light on the subject, either from detailed knowledge of particular themes, owning MISB sets or building instructions, or having better insight (or eyesight) when squinting at small pictures, please let me know. I have included a list of specific questions at the end of the pdf document, relating to 26 sets I could not decide about (including the 17 shown in the piechart as ‘uncertain or inconsistent differences’. 57 set versions currently in PlaymoDB PlaymoDB set versions (note 3257y is Version 2 of 3257 but there is no 3257x or Version 1 in PlaymoDB, 4287/4287a (these sets dont fit my criterion for being different versions) and 9990x/9990 (Spain exclusives) are not included in the illustrations in the pdf). Possible additional versions for PlaymoDB (Sets with 4 or more differences between versions). PlaymoDB Sets where there are versions with 4 or more differences between versions not currently in PlaymoDB (The sets shown currently have only this version included in PlaymoDB). Wow. That is a LOT of info!